Normally I like to use Power Strip to overclock, however the program was having difficulties recognizing the card's default core and memory clock speeds. I searched for an alternative and found RadClock and tried it out. It was a success. The core speed of 398MHz and memory speed of 304MHz was displayed on the utility. I then began to slowly raise the bar of both the core and memory clocks. After many tries I finally found the magical frequencies and let me tell you there were very impressive! The core clock was increased by 148.75MHz which is a 37% increase in performance! Quite impressive. 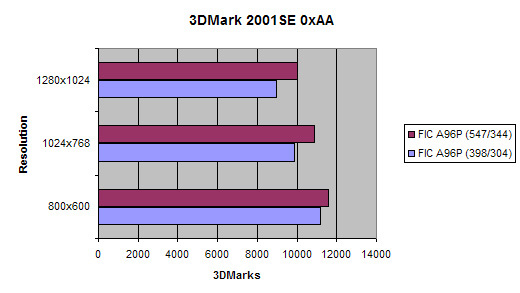 Now that the card is overclocked, lets see how well performs in 3DMark compared to its default core and memory speeds. 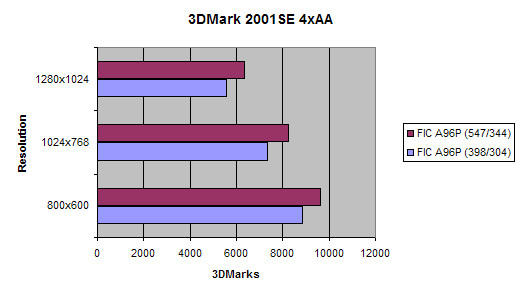 The results show that there was quite a nice boost in performance due to the huge increase in clock speeds. 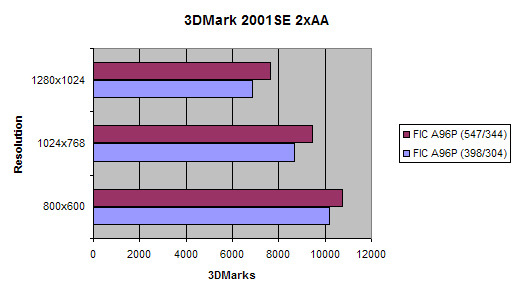 Another thing to note is while the the A96P is overclocked it still is only cooled by a small heatsink and fan combo. A big applause for the .13 process and its very minimal amount of heat production.